Apowersoft Screen Recorder, which is a professional screen video recorder for Windows, allows you to capture the whole screen and audio activities with decent quality. So, you can record screen video with ease and make a tutorial for teaching or displaying at will. It's really a brilliant feature that the application can record screen and video with audio from systems, Microphones, or both. More strikingly, it supports recording screen and audio activity synchronously, which eliminates the game players' doubt whether there exists a software capable of keeping the games and their voice in sync. If you want to record screen video through a webcam, this screen recorder, which is available for Skype, MSN, and GTalk, as well as many others, can indeed do what you need. It saves the recording to standard WMV format file by default, so you can share it with others directly. Catering to different users, the Screen Video Recorder, which can apply to any website, is an excellent assistant to record any live streaming video from Twitch TV, BBC, CNN, and Livestream, as well as many other live video websites. It's the best choice to use for collecting video clips. - Full Screen: records what happens on the entire computer screen. - Custom Area: enables you to select any portion of the screen to record. - Around Mouse: tracks your mouse to record. - Select Window: selects the window you launch on screen to record. - Obviously, these thoughtful modes win users' favor and users tend to choose this as their screen recording tool. What makes it remarkable is that the program has a considerate design. That is, it enables you to create a scheduled task by presetting the start time and the customized duration. Thus, you can record screen video without staying in front of the computer. Someone wants to save the pictures displayed on videos or other places where it can't be saved directly, and this software can really satisfy you. 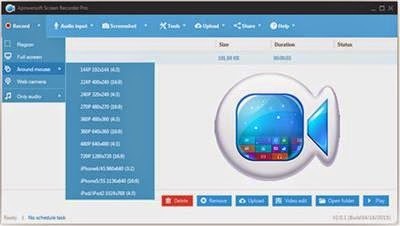 It can capture whatever pictures you saw on your computer screen and save the captured pictures to a standard image format, such as JPG, PNG, BMG, GIF and TIFF. After your recording, the built-in video converter can help you to convert the video better and faster. You can choose one of the formats that Screen Recorder Pro provides to convert, such as AVI, MP4, FLV, SWF, 3GP, MKV, and MPEG, or popular design formats for Apple, Android and Sony devices.